Farrar, Straus and Giroux (BYR), 9780374301903, 14pp. A short and sweet mini-adventure especially created to introduce the youngest guppies to the New York Times-bestselling Pout-Pout Fish. Swim along with Mr. Fish as he shows his friends just how much he loves them. With just one line of text per page, this simple, 12-page board book will send Deborah Diesen and Dan Hanna's much loved Pout-Pout Fish flippering and swishing into the hearts and minds of very young children. 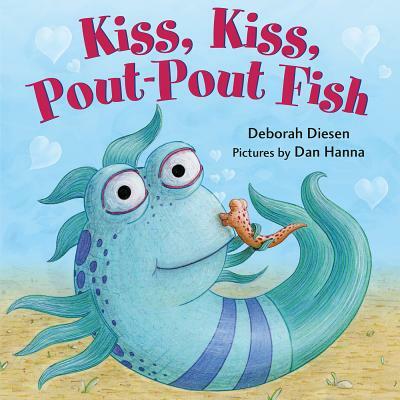 Deborah Diesen is the New York Times bestselling author of The Pout-Pout Fish, named by Time Magazine as one of the Ten Best Children’s Books of 2008, and The Pout-Pout Fish in the Big-Big Dark. Diesen grew up in Midland, Michigan, and started writing poems at a young age. She has worked as a bookseller and a librarian, and now works for a small nonprofit organization, but her greatest joy comes from writing for children. She lives with her family in Grand Ledge, Michigan. DAN HANNA has over ten years’ experience in the animation industry, and his work has appeared on BBC America and the Cartoon Network. He lives in Santa Barbara, California. He is the illustrator of the Pout-Pout Fish books.